I promised I'd finish up the January show top 20 this week, but..... I've been up since 6:30am and have done nothing but work and chase ungrateful kids all day. I've got about 10 minutes to breathe now, which is not long enough to do a decent post, but is enough to whip up something real quick. Here's a card that didn't quite make it into the top 10 from last weekend's show (mainly because I couldn't think of a good angle for a post when I was making the list) but is still quite nice. So when I got to the card show I had a game plan ready to go. Then I fumbled, and balked, and stuff I was expecting to be there wasn't, and I panicked a bit, and then I sucked it up, and got it together, and made some bold moves and came out of the show with a big win. A lot of the stuff I thought I'd focus on (1954-56, 1960 and 1972 especially) didn't work out at ALL so I improvised. One way I improvised was by deciding to collect three new things that I wasn't focusing on before. That's right! If you can't find something you want at a show, decide you want something different! This card right here is the first official pickup of a new player collection. '64 Topps Pitching Leader card. No I'm not collecting Whitey Ford. 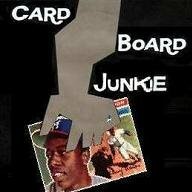 I also remember the 1991 World Series so I ain't collecting no Twin. That's right! I'm hoarding Jim Bouton cards now. I have already accumulated a small stack of Boutons more or less by chance, but now it's Official. So far I've got a small pile of vintage cards, some recent cards from Legends sets, a relic card and 3 of his books. Not looking forward to the '62 High number rookie but a League Leader card is well in my budget. Jim seems a little miffed to be listed after Camilo even though they tied with 21 victories apiece, but it would look kind of odd if he was just staring out into space on the left side of the card. The Chairman of the Board gets the top all to himself. that's what you get with 24 wins, folks. 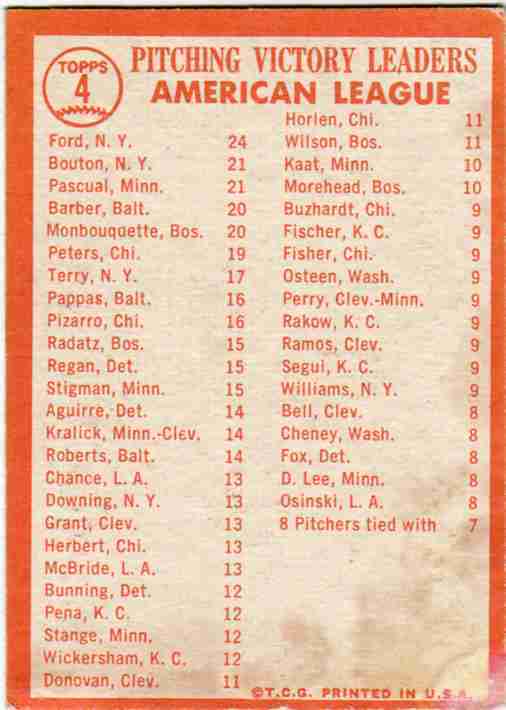 The nice thing about these '64 Leader cards is that the backs list so many players you have stats for practically half the league on one card. This back is a little disappointing because there's a large blank space on the card that could have been filled if it weren't for the copyright line. There's still plenty of names to gawk over on the back. The card's a little water damaged but still in presentable shape. I think my 'I'm officially snagging every card I can of this player' list now stands at Chipper Jones, Jason Heyward, Yogi Berra, Mark Lemke, Jim Bouton and... well, that's another post. January Vintage Show Top 20 - #4 Awwww, come ON. 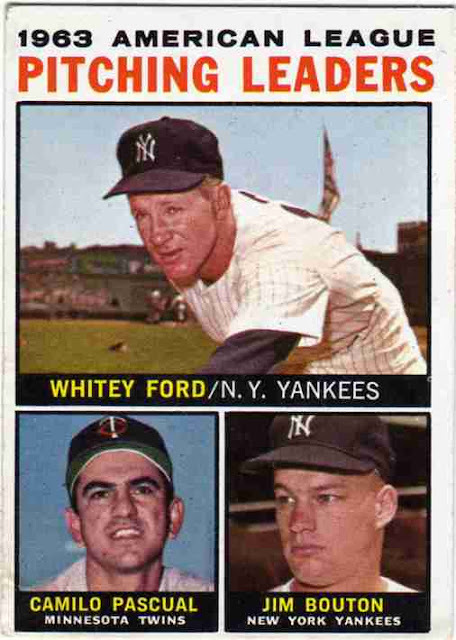 January Vintage Show Top 20 - #12 '59, Dude!